The colour output is adjustable from tungsten to daylight and every point in between, and is completely dimmable from 100% to 10%. Most importantly, the light quality is the best available: »CRI: 98ra (daylight) / 97ra (tungsten). 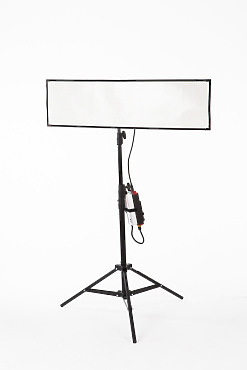 The Bi-Flex 4 panel, at 48“x12“ weighs only 2 pounds. 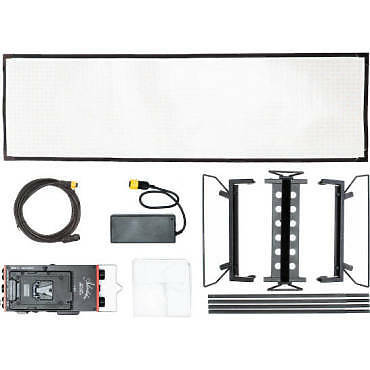 This kit includes a professional-grade dimmer with a battery plate built in (V-Lock or A/B Gold Mount) and DMX controls, and a 23ft extension cable. Working with high CRI bi-colour light essentially means there is no need to colour correction or warming gels (CTO). If you’re shooting a portrait with the light set to full daylight and want to add a touch of warmth for improved skin tone, it’s just a turn of a dial. Hire the Aladdin Bi-Flex 4 from Procam. Best service and rental rates for the Aladdin Bi-Flex 4 and all cameras, lenses, sound, lighting and grip.